Antidepressants have helped many people overcome mental health problems. But some people may abuse the drugs to get high or because they are not experiencing the medication’s effects fast enough. Your individual needs and the severity of your addiction. Any co-occurring mental health disorders or addictions. The right fit for your teen, if you’re looking for a rehab program for your teenager. People are most commonly prescribed antidepressants to treat depression, anxiety and other mental health conditions. Antidepressants are therapeutic for many individuals when taken properly. But some people may develop patterns of problematic and compulsive use. Frustrated with prescribed dose. Many people don’t begin to experience the effects of antidepressants until about 4-6 weeks after they begin taking them. If someone is prescribed an antidepressant for depression or anxiety, he or she may get frustrated that the medication isn’t working right away and could take higher doses to feel better. This misuse can lead to abuse and is dangerous. To get high. Additionally, people tend to abuse antidepressants for their stimulant-like effects. This may involve crushing and snorting them or injecting them. This can cause many unwanted side effects as well as cause or exacerbate mental or physical health problems. Who Answers? if you or a loved one is experiencing these signs or symptoms. Multiple prescriptions for the same antidepressant lying around. Intranasal damage: bleeding nasal mucosa, perforated nasal septum and sinusitis. Intravenous damage such as collapsed veins, skin and soft tissue infections and contraction of HIV or hepatitis. The cost of antidepressant rehab depends on many different factors. Length of treatment: 90-day treatment will cost more than 60-day treatment, just as 60-day treatment will be more expensive than 30-day treatment. Location of treatment: If your recovery program is located in a beautiful location with a nice view, treatment may cost more than similar facilities at less desirable locations. Additionally, if you have to travel for your treatment, factor in the cost of a flight. Type of treatment: Typically, inpatient drug or alcohol rehabilitation is more expensive than outpatient rehabilitation. This is because you live at the facility and receive around-the-clock care. Insurance coverage: Many insurance companies provide partial or full coverage for addiction treatment. Call 1-888-319-2606 Who Answers? to get more information about what your insurance covers. Crowdfunding: Websites such as IndieGoGo and GoFundMe allow you to raise money for whatever cause you choose. This is an effective way to ask friends and family for their help. Financing recovery options: health care credit card, health care loan, personal savings account/credit card. Medicaid, Medicare: Those who have Medicaid or Medicare qualify for addictions treatment coverage. Payment plan or sliding scale: Some treatment facilities offer individualized payment plans or sliding scales, where you only pay what you can reasonably afford. Health insurance exchange: The state insurance marketplace set up under the Affordable Care Act allows you to shop for health insurance and compare plans. Compulsive misuse of antidepressants can have severe repercussions to your physical and metal health. Substance abuse treatment programs can help those struggling with antidepressant abuse. Outpatient rehab is recommended for those suffering from a mild addiction to antidepressants. It allows you to live at home while attending therapy and counseling at a rehabilitation facility. Many people prefer outpatient due to the flexibility. You can attend to work or school while recovering. Intensive outpatient: 4 As opposed to typical outpatient care, this provides a higher level of care and consists of at least 9 hours a week in treatment. Therapy and counseling: 3 Therapy and counseling focus on the development of healthy coping skills to help you deal with triggers. You work on building communication skills as well as repairing broken relationships. Inpatient or residential rehabilitation programs require you to live at the treatment center for the duration of treatment. This option is recommended for those suffering from a severe and debilitating antidepressant addiction. You receive around-the-clock medical care, individual therapy and group counseling. Residential: You live at the facility throughout your stay. Common lengths of treatment are 30 days, or extended stay programs of 60 days or 90 days, depending on your needs and situation. Luxury: This inpatient treatment option is similar to the more standard residential program. But in addition, luxury programs typically offer more recreational activities, vacation- or resort-like settings and other fine comforts and amenities. Executive: Executive inpatient treatment is also similar to luxury/residential. But it is designed for professionals to continue working while recovering from antidepressant addiction. 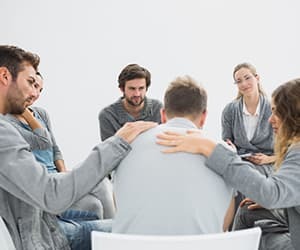 12-step programs, such as Narcotics Anonymous 7 and Drug Addicts Anonymous, 6 are useful for those who prefer supportive and encouraging group environments. Members share their experiences with addiction and help each other to remain sober. These programs follow the 12 steps popularized by Alcoholics Anonymous. The only requirement is a desire to quit using substances. These fellowships have meetings all over the world, which you can attend for free. Some treatment programs specialize in dual diagnosis addiction treatment. If you suffer from a co-occurring mental health disorder, then it’s suggested that you consider this kind of antidepressant recovery center to prevent relapse and to address all disorders. The notion of entering an antidepressant rehabilitation program can be frightening or daunting if you don’t know what to expect. The treatment process begins with intake and consists of detoxification, therapy and aftercare once the program is completed. A therapist meets with you, evaluates your addiction and identifies any co-occurring disorders. The intake assessment should be thorough to create an appropriate individualized treatment plan. Antidepressant withdrawal symptoms can include nausea, irritability, headache and lethargy. Many antidepressants have unpleasant withdrawal symptoms that occur when you suddenly stop taking the medication. Because of these withdrawal or discontinuation symptoms, a tapering schedule will likely be prescribed as you enter detox. Therapy works to change problem behaviors and build coping skills while examining the underlying causes of addiction. This is any form of treatment you receive after you complete initial treatment. Aftercare helps to prevent relapse and to continue to build coping and communication skills developed during treatment. 12-step programs such as Narcotics Anonymous and Drug Addict Anonymous. Quality of the staff. Top treatment centers will have a full roster of certified and qualified staff. Ask about the certification and degree requirements for staff members (such as addictions counseling, clinical psychology or any associated mental health degrees). Family involvement. Many antidepressant recovery centers will involve the family during rehabilitation. This allows the family to grow stronger as a system while improving communication and weak relationships. Ability to treat other conditions. Often, those who abuse antidepressants will additionally be struggling with mental health issues, such as depression and anxiety. It may be necessary to find a treatment center that has experience in treating mental health conditions without medication. Teen addiction treatment may differ from adult treatment, depending on the type. Inpatient: Teens live at the facility while receiving individual therapy and group counseling, as well as academic tutoring. Wilderness: 11 This treatment is similar to inpatient rehab except certified professionals treat the teens while on a wilderness expedition. 12-step programs:12 12-step programs, such as Teen Addiction Anonymous, provide the teen with recovery support. The program follows 12 steps based on powerlessness and willingness to recover from addiction. Outpatient: The teen may choose to attend outpatient treatment if his or her addiction isn’t severe. He or she can still attend school and live at home while receiving necessary interventions. It’s important to find an antidepressant addiction rehab program that involves the family in the teen’s recovery. The teen will typically be living with one or both of the parents upon completion of treatment. So it’s important to engage the parents as well as siblings. A few therapeutic approaches use family involvement as a vital component of treating teen addiction. Brief strategic family therapy: 9 This therapy takes place over 12-16 sessions, and the family works to change negative behaviors. Family behavior therapy: 9 The teen and at least one parent choose the interventions. Parents are taught different skills during the sessions to use at home. Functional family therapy: 9 This therapy improves conflict resolution and communication skills while instilling motivation for positive change. Multidimensional family therapy: 9 This therapy helps to improve the family’s interactions with the community, including school or juvenile justice. Multisystemic therapy: 9 This is also a family and community therapy in which different members of the teen’s systems are evaluated. For instance, the parents may not discipline their teen properly, peers may be encouraging drug use and the school may have a high drop-out rate. Antidepressant abuse can cause serious health problems if untreated. If you’re struggling with antidepressant abuse, or know someone who is, call 1-888-319-2606 Who Answers? to speak with a treatment support representative about a recovery center that fits your needs.
. American Psychiatric Association. (2013). Diagnostic and Statistical Manual of Mental Disorders (DSM-5).
. Harvard Women’s Health Watch. Going off antidepressants. (2010). Retrieved October 22, 2015, from http://www.health.harvard.edu/diseases-and-conditions/going-off-antidepressants.
. SAMHSA Center for Substance Abuse Treatment. (2006). Substance Abuse: Clinical Issues in Intensive Outpatient Treatment. Rockville (MD): Substance Abuse and Mental Health Services Administration (US) (Treatment Improvement Protocol (TIP) Series, No. 47.) Chapter 4. Services in Intensive Outpatient Treatment Programs. Available from: http://www.ncbi.nlm.nih.gov/books/NBK64094/.
. Johns Hopkins Medicine. Treatment Settings. (n.d.). Retrieved November 9, 2015, at this http://www.hopkinsmedicine.org/substance_abuse_center/treatment/settings.html#php.
. Drug Addicts Anonymous. (n.d.). Retrieved November 16, 2015, from http://www.daausa.org/site/Welcome.html.
. Narcotics Anonymous. (n.d.). Retrieved November 16, 2015, from https://www.na.org/.
. National Institute on Drug Abuse. Treatment Approaches for Drug Addiction. (2009, September 1). Retrieved November 10, 2015, from http://www.drugabuse.gov/publications/drugfacts/treatment-approaches-drug-addiction.
. National Institute on Drug Abuse. Evidence-Based Approaches to Treating Adolescent Substance Use Disorders. (2014). Retrieved November 16, 2015, from http://www.drugabuse.gov/publications/principles-adolescent-substance-use-disorder-treatment-research-based-guide/evidence-based-approaches-to-treating-adolescent-substance-use-disorders.
. Rahman, S., Mohiuddin, S., & Hua, L. (2013). Seizures Secondary to Bupropion Misuse/Abuse: Three Cases. Adolescent Psychiatry APS, 208-211. Available at http://www.ingentaconnect.com/content/ben/aps/2013/00000003/00000002/art00013.
. Wilderness Treatment Center. (2015). Retrieved November 10, 2015, from http://wildernesstreatmentcenter.com.
. Teen Addiction Anonymous. (2014). Retrieved November 10, 2015, from http://www.teenaddictionanonymous.org/.